The origins of the building are still unclear, although it is assumed that (as it name implies) it was connected with the custom of leaving money or property to pay a priest to pray for the soul of the departed. Possibly the rents from the property and the land attached to it were used to provide an income for the priest. English Heritage has listed the building as late sixteenth or early seventeenth century with an eighteenth century extension. We know that the property has been both two separate buildings and one single household at various times in its history. The house does look as though it could easily have been two separate properties. The view of the building from the back, taken soon after it was taken over by the Community Association, shows what look like three distinct periods of the building, the oldest being to the right-hand side. When Thornbury and District Community Association took over The Chantry in 1966 they found a reminder of the building’s past. 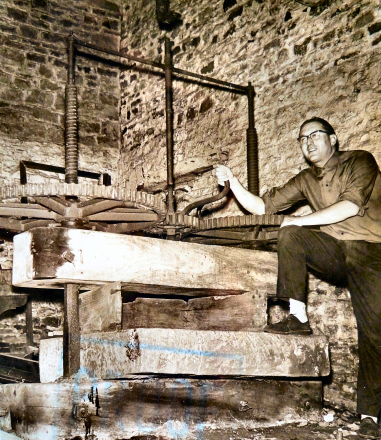 It was the cider press that probably produced the 1,100 gallons of cider (and doubtless many more) also sold with the estate in 1926. Please click on the thumbnail image below on the right for a larger photograph. 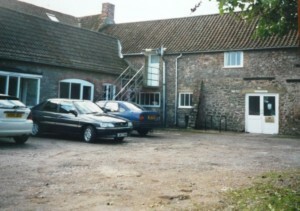 One of the outbuildings (presumably the coach house) was later converted into a theatre and other facilities for the Community Centre. The photograph of the building below on the left is a thumbnail image. Please click on it for a larger version. 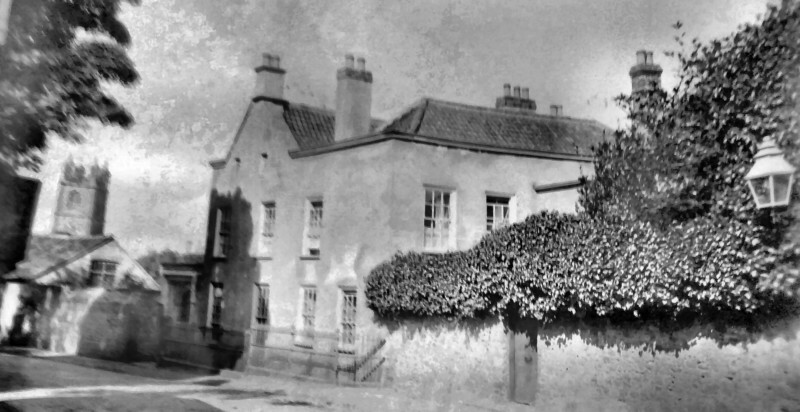 In articles written by the early members of the Community Association it was described both as a “Bothay” that was about 400 years old and also as having been “completed in the late nineteenth century.” Thornbury Roots feels unable to express an opinion on this widely differing description. One of the interesting features of the exterior of The Chantry is the wooden door and surrounding stone archway that leads from Castle Street into the conservatory on the side of the building. 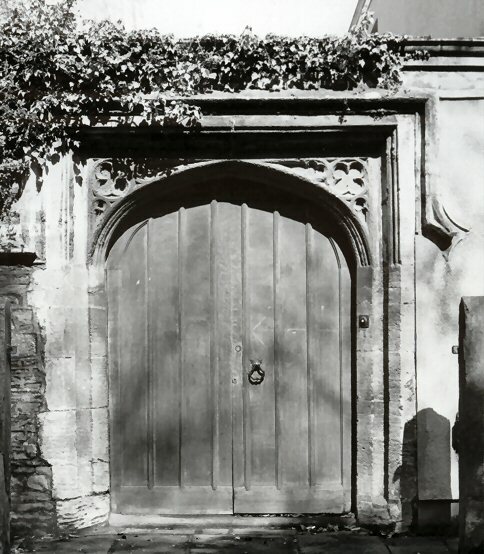 This doorway is generally believed to have come from Thornbury Castle, much of which was left in a near derelict state for many years. The castle is said to have been the source of building materials for more than one building in the area. Please click on the thumbnail image on the right to see a larger photograph of this architectural detail. “Richard Hamden hath embesyled and perloyned away certen newelles out of Thornbury Church”. As Richard Hampden owned The Chantry at this time it would seem that some of the architectural features of The Chantry did indeed come from elsewhere. This extra building is as well as the coach house stable etc that are still visible. In recent years a gardener working at The Chantry found what appeared to be the foundations of this building. Roger Howell led an amateur archaeological study of the remains of the property which is now covered by lawns. The Chantry could have had an outbuilding close to it at a rather later date. 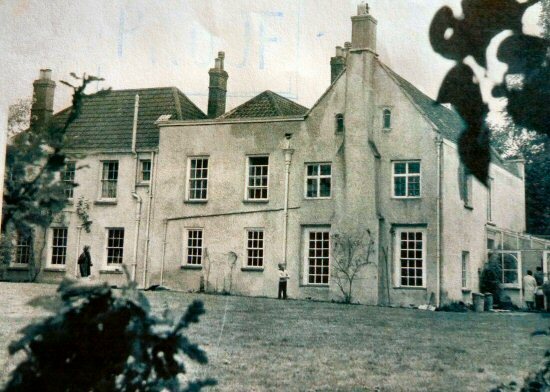 This appears to be the case in the image here on the right, although the perspective might be unusual and it might be the house now known as Wellbourne House. We would like to learn more about it and its use. Please click on the thumbnail image to see a larger photograph. 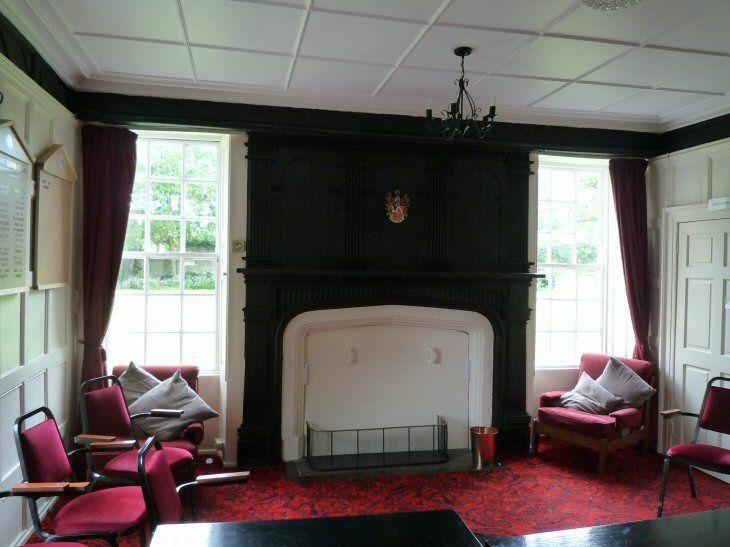 When the Chantry was bought by the Thornbury and District Community Association in 1966 the new owners were very aware of the heritage of the building, the drawing room in particular (which was described in newspaper articles at that time as Jacobean). 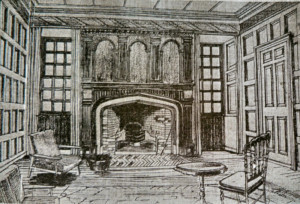 Some sources have mentioned the date 1610 in connection with the panelling in this room, although we have no information that could account for this very specific dating. 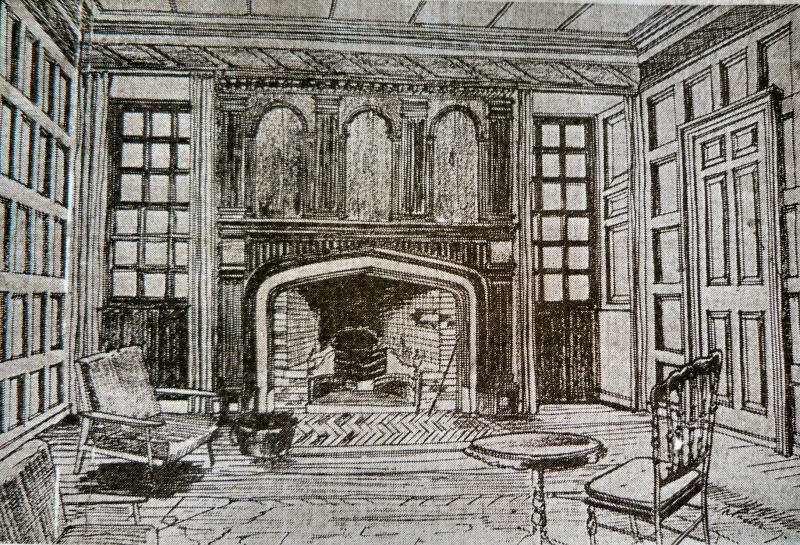 Here on the left is a sketch of the room which the committee of the Community Association intended should keep its period feel. Despite the passage of time since then and the financial constraints that a charitable trust usually experiences the room is still recognisable today. 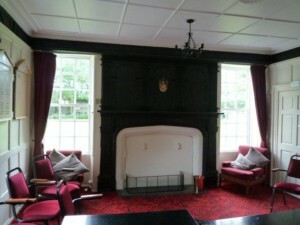 The image below on the right is of the modern day “Tudor Room” in The Chantry. Please click on the images to see larger photographs. Another of the downstairs rooms is believed to be of the same period and these and two rooms on the floor above and in the attic are thought to be the oldest part of the existing building. Architectural historians have estimated that the roof above this part may date back to the sixteenth Century. There are interconnecting doors to the earlier rooms in the building and some of these are as low as five feet and so are no longer used. The walls here are said to be very thick – one article we have seen says they might be as much as three feet thick. The middle part of the house is believed to be eighteenth century. It has been said to date from 1740. The wall of what was the dining room and is now the bar is curved and this is continued into the door to the room which is also curved.